I have learned recently that I am not a fan of the Mass Effect series. After more than 100 hours of playing the three games, it has been brought to my attention that I did not, in fact, enjoy it. How did I learn that, you ask? I enjoyed the ending of Mass Effect 3. 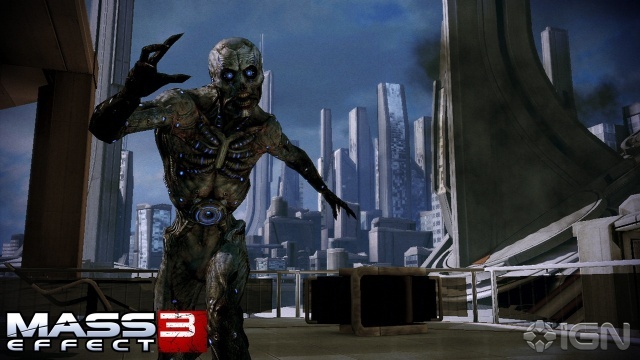 Let me start by saying that I didn’t love the end of Mass Effect 3, but I liked it. I thought it was good. Sure, it left some unanswered questions about what happened to my team, but that was minutiae that I didn’t really care about. It would have been nice to see, but I wasn’t upset it wasn’t there. But the part with the Normandy fleeing the explosion definitely left me puzzled. It implies that people who like the ending aren’t fans of the series, and I find that incredibly insulting. I love the Mass Effect universe as much as anyone else. There’s so much there that I wish I could explore, but can’t: the scans of planets that talk about structures hidden in clouds, the origin of the Reapers, what comes next. I want to know it all. This is what Mass Effect fanboys look like when they complain incessantly about the ending of the game. Image from IGN. However, I also respect Bioware’s artistic integrity. Calls for them to change the ending are just obnoxious and just seem like the infantile whining of people who aren’t used to not getting their way. Yes, Mass Effect gave players an unprecedented amount of control and input over the story. But in the end, it was still Bioware’s story — we were just along for the ride. The Internet has created a flaming fanbase. It’s amazing how the larger a group of people grows, the lower its collective intelligence becomes. These days, when something doesn’t go the way “the fans” want, the Internet instantaneously erupts with vitriolic hatred. So many people seemed to have let the last five minutes of Mass Effect 3 color their entire perception of the game. I didn’t love the way the game ended, but I loved every other minute of it other than those last five. So I’m not going to let them ruin what was otherwise an incredible experience. My bonds with my shipmates grew deeper. I learned more about the galaxy. I ended long-standing conflicts and, in the midst of war, created peace. My Shepard died, but his legacy will live on in the galaxy. The end with the Stargazer showed that, even though the Mass Relays were destroyed, galactic civilization managed to persevere. Interstellar travel still exists, and the threat of the Reapers is gone. For the first time in who knows how long, galactic progress won’t be reset every 50,000 years. There are no pre-set paths for civilizations to grow along (because that’s what the Reapers did with the Mass Relays and the Citadel). For the first time, species are forced to develop their own technologies for faster-than-light travel. They’re forced to think for themselves and not rely on what was left behind. And that’s because of my Shepard. That’s the legacy he left behind: hope. That was how Mass Effect 3 ended for me. Not with a different colored explosion, but with the knowledge that, through what I had done and the sacrifices I made, there was hope for the galaxy. And if that means I’m not a fan of Mass Effect, then so be it.